The question, ‘Should Labour care about selective faith schools?’ received an overwhelming yes yesterday evening, as Labour Humanists held a Fair Admissions Campaign-themed event in central London that was standing room only. 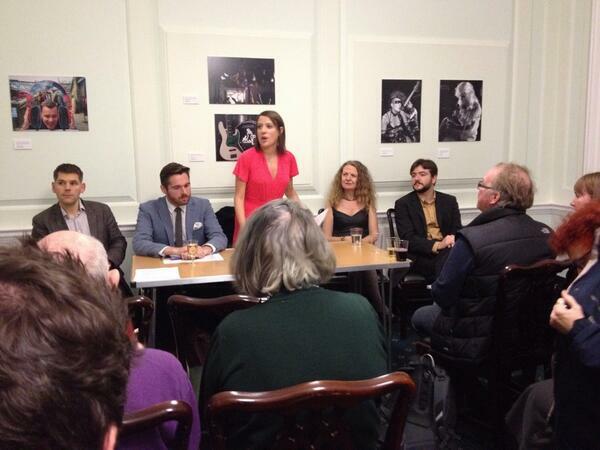 The event, chaired by Labour Humanists chair Naomi Phillips, featured contributions from London Assembly Member Tom Copley, British Humanist Association Chief Executive Andrew Copson, Fabian Society General Secretary Andrew Harrop, and author and columnist Joan Smith. Separately Tom Copley and Labour Humanists have made a joint submission to the Labour Party’s Your Britain website, where party members can vote in support of fair admissions. Labour Humanists and the BHA are among many supporting groups of the Fair Admissions Campaign, with support also coming from religious groups and individuals such as Ekklesia, British Muslims for Secular Democracy, the Hindu Academy, the Unitarians and Accord Coalition Chair Rabbi Dr Jonathan Romain, and from political groups such as the Green Party, Liberal Democrat Education Association, Liberal Youth, and Socialist Educational Association. Speaking first, Andrew Copson gave an overview of recent research published by the Campaign on the extent to which religiously selective admissions policies contribute to segregation. Mr Copson cited statistics showing that faith-based selection causes socio-economic and ethnic segregation, referring to measures such as eligibility for Free School Meals, English as an additional language and ethnicity. He deplored the policies employed by schools such as the London Oratory School, a state funded Catholic secondary which selects on the basis of parents doing flower arranging, and Twyford CofE High School, also state funded and yet prioritising parents on the basis of ‘Assisting with collection/counting money’, ‘Tea & coffee Rota’, ‘Church maintenance’ and ‘Parish Magazine Editor’. Copson cited huge public support for a change in the law. Joan Smith spoke more widely about her concerns about state funded faith schools – concerns which were largely outside of the scope of the Fair Admissions Campaign, but highlighted how in her view such issues are compounded by faith-based admissions policies. Andrew Harrop movingly described how his daughter started primary school this term, but didn’t get into their first choice of school: she had been at a Catholic nursery for the past two years, but was ‘expelled’ because the school’s admissions policy prioritises Catholics (which he and his wife are not) over other Christians, those of other religions, and lastly those of no religion. His daughter was very upset about this and didn’t understand, and instead has ended up at a good but more socio-economically disadvantaged school – which he didn’t believe would be a problem for her but would affect other children’s prospects more drastically. Harrop emphasised he is a supporter of the state funding of faith schools, citing the Churches’ historical role in providing education. But he stated his opposition to discrimination in admissions, and asked the Churches whether they are comfortable presiding over ‘a fraudulent and deceptive system’ that people game. He implored Labour to decide to act on the issue soon. Tom Copley pointed out that the segregation is based on the faith of parents, not the faith of the children who may decide they are of another religion or belief. He pointed out that there is no segregation of trains or hospitals on a similar basis, and described the problem as a ‘huge equality issue’ with people not being able to access local schools. Mr Copley particularly thought it perverse that faith schools often prioritise those of other religions over those of no religion: ‘better you believe in the wrong God than no God at all.’ Tom fears that ethnic segregation in schools is getting worse, highlighting research that education children together produces greater understanding. For further comment please contact BHA Head of Public Affairs Pavan Dhaliwal on 07738 435 059 or email info@fairadmissions.org.uk. The Fair Admissions Campaign is today revealing some of the most unrepresentative schools in the country on the basis of the proportion of intake that speaks English as an additional language – including one school, Twyford Church of England High School, that gives priority in its admissions to pupils whose parents participate in ‘voluntary service’ such as ‘Bell ringing’, ‘Flower arranging at church’, ‘Assisting with collection/counting money’, ‘Tea & coffee Rota’, ‘Church cleaning’ and ‘Church maintenance’. In 2011, Michael Gove visited the school where he called it ‘a superb state school which draws children from every social background and gives them all a rigorous academic education’. Then in July, Mr Gove gave a speech to the Church of England in which he praised the head for the inclusive approach to the issue of school admissions at a new Free School which she was involved in setting up. But Twyford itself is in fact extremely selective. The school allocates 150 of its 180 places to Christians, awarding them points for meeting the aforementioned criteria, along with others such as ‘Parish Magazine Editor’ and ‘Technical support’. Similarly, children are awarded points for taking part in ‘Choir / Music Group’s associated with the Church, and for ‘Church based outreach’. The remaining 30 places are allocated to parents and children of other faiths who take part in similar activities, such as ‘Cleaning place of worship’, ‘Serving refreshments at place of worship’ and ‘Preparing food at place of worship’. At Twyford 10% of pupils are eligible for Free School Meals, compared with 24% of the public living in its local area (known as a middle super output area), 26% across pupils at schools sharing the same first half of post code and 27% across its borough. 10% of pupils speak English as an additional language (EAL), compared to 20% of the public in its MSOA, 39% of pupils across the post code, 50% across the borough and 47% across all neighbouring boroughs. This makes the school the ninth most unrepresentative school in the country, based on comparing the number of pupils speaking EAL to their local areas. The most unrepresentative school is The King David High School in Manchester, a Jewish school which has admissions criteria to select 100% of pupils on religious grounds. 26% of local pupils speak EAL, compared to 1% in the school. The second worst is The King’s (the Cathedral) School in Peterborough, a Church of England school which has admissions criteria to select 89% of pupils on the basis of faith. It requires five years of worship but doesn’t objectively set out how this is assessed – a potential breach of the Admissions Code. The school also selects 12 places on general academic ability, despite not being a grammar school. 31% of local pupils speak EAL, compared to 7% in the school. The fifth worst is the JFS, which has admissions criteria to be 100% selective, and is the Jewish school that had a famous court battle over its religious admissions criteria in 2009, as a result of which it was found to be discriminated on grounds of race. It gives priority to those attending Jewish primaries without naming them and to those doing Jewish charitable work, both likely breaches of the School Admissions Code. 22% of local pupils speak EAL, compared to 9% in the school. The eighth worst is Finchley Catholic High School, which has admissions criteria to be 100% selective, Catholic school in Barnet. It gets both parents to fill in a very subjective self-assessment form for the priest, who then decides whether this is adequate to provide a reference to the school with no objective criteria for this coming into play – likely to be a breach of the School Admissions Code. 17% of local pupils speak EAL, compared to 7% in the school. In total, 24 of the worst 100 secondary schools, or 27 of the worst 100 non-grammar schools, are religiously selective – compared to just 16% of all secondaries. For further comment please contact BHA Head of Public Affairs Pavan Dhaliwal on 07738 435 059 or Accord Coalition Chair Jonathan Romain on 07770 722 893 or email info@fairadmissions.org.uk. The Church of England’s London Diocesan Board for Schools recently told the Campaign that its ‘…policy is to encourage our Church of England Schools to have half open places and half foundation places. For the new schools we are promoting we are going for all open places’.